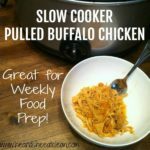 This easy Crockpot Buffalo Chicken recipe is going to become a favorite easy meal that satisfies everyone at the dinner table. Add all ingredients except Frank’s and Tabasco to your crockpot. Cover chicken with Frank’s (JUST enough to cover) and add Tabasco if you want it spicy or sub some Tabasco in the place of Frank’s for less sodium. Cook on low heat for at least 7 hours. Once cooked, set aside 1/2 cup of broth and pour out the remaining. Return chicken and 1/2 cup of saved broth to crockpot and cook on high heat for an additional 30 minutes.